After over five months on the road we wanted to share our packing list in case it can help anyone else preparing for an extended road trip or overlanding adventure. We spent a lot of time discussing what gear we wanted to bring and how it would all fit! Overall, at five months in we are feeling pretty good about what we have packed as most items have been used. If there is something we haven’t used we’ll note it below! We have yet to get stuck so this equipment hasn’t been used yet but we are still glad we have it just in case! Wok style frying pan – we used this pot all of the time at home and knew we needed to make room for it in the truck kitchen. We use it for almost every meal. Biodegradable camp soap – great for dishes, showers and laundry – but we mostly use it for dishes. One large”ish” plastic container – this holds most of our non-perishable food! 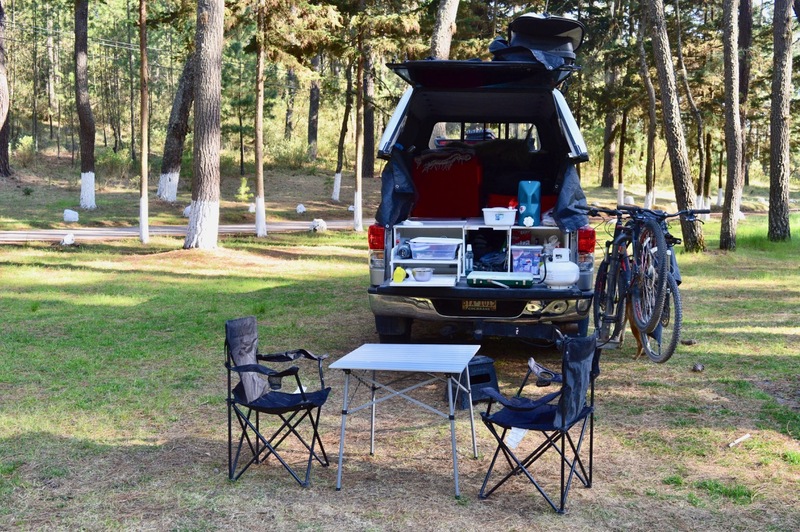 ARB 50L Fridge – this is one of our favourite items and makes life on the road way easier! Two folding camp chairs – these were $10 each from Walmart, they have been used every day for the last five months and it’s starting to look like they could completely give way any moment (currently sitting in one typing…living dangerously). One lounger – this thing is rather large and heavy but we had room for it in our Sportrack carrier. We’ve had it out occasionally, nice to have but a little bulky. We are thinking we might “donate” this at some point so we can take some weight off our roof. Anyone want a really nice lounger?? Two Water Jugs – 14 gallons (26.5 Liters each) – we have not yet come close to running out of water and have easily found fill up stations. Camp table – a folding camp table is a must! 10×10 pop-up tent + room – this thing is huge and we we’re lucky to have space for it. We honestly debating returning it as we weren’t sure we needed something so big and didn’t know if we would use it. So far, we have made good use of it, it’s nice to have shelter off the back of the truck and it also works great as a beach shade! If you have an awning of your roof rack that would probably serve the same purpose just less portable. Small shovel, hand sanitizer, toilet paper…. Yes, when traveling you need to be prepared to dig a hole sometimes. We follow Leave No Trace principles. Flashlights – forever a fan of headlamps. Our evening accessory of choice is the headlamp. Bikes – we have not used the bikes nearly as much as we planned, so we are on the fence if bringing them has been worth it. With the dog we find that we often end up walking to places versus biking. Roo loves biking but it makes navigating a little trickier! Surfboard – we picked this up in San Diego! Disinfecting wipes – always handy to have! Mini broom – we lost our first broom somewhere in Wyoming, luckily, we managed to procure a replacement. I (Brenna) am constantly sweeping out the truck bed in a never-ending battle against sand and dust. Carpet cleaner – we didn’t start the trip with this but picked it up to help us get the scent of Roo barf out of the cab of the truck and it worked like a charm. We have since used it on our mattress covers which Roo also barfed on. It’s been a winner. We won’t bore you with the details but let’s just say we’ve been big fans of the poufy down (or synthetic down) jackets – we lived in them for the first two months of the trip and even dug them out recently when hiking a volcano in Guatemala. The only other thing I would note here is you don’t require nearly as many clothing items as you think. We had limited space which really forced us to be selective. I think we’ve both worn everything we packed at some point. Microfiber towels – if you are traveling this our worth their weight in gold. They pack up small and dry so fast! GlocalMe Wifi HotSpot – you can purchase plans online and connect up to five devices. It has been nice having this as a backup when trying to get a SIM card, however it hasn’t always had service…. Still debating whether it was worth the purchase! Phones x2 – we have relied on our phones for navigating. Mitchell broke his first phone in la Cruz and purchased a replacement in Mexico. The Mexican phone he purchased (a Samsung Galaxy J6) was cheap ($200 CAD) and was also a significant improvement over his last phone. There are lots of good, budget friendly android smartphones in larger cities in Mexico! Driver License – we have relied on our Alberta licenses but also each got an international driver’s license as a backup. Many copies of all of the above documents! You often have to provide copies when crossing borders and it’s easier to have some on hand. Dashcam – we had debated getting this before we left and didn’t buy one. Before crossing into Mexico we came across one for ~$20usd in Walmart and decided it was worth the investment. We luckily haven’t had a real need for it yet! Glass wine glasses – wine is better in glass! Mosquito net bed cover – in mainland Mexico we had our first run in with sandflies and really bad mosquitos – this was a very needed acquisition. 12v fan – it’s getting hotter as we head south and we wanted to have a little more air flow. Thanks to Mitchell’s Mom for bringing the mosquito net and 12v fan when she came to visit! Side note, when running the 12V fan at high power it actually has the capability to force mosquitos through the bug net. The majority of the mosquitos do not survive this experience but it is not always enjoyable to wake up in a mosquito graveyard with one or two shell shocked survivors flying around so we typically run the fan on its low power setting. I just installed a ezlift topper and tent to my Tacoma. A one month, short trip is planned and your list is definitely helpful. Hi Joseph – thanks for the comment. Glad to hear it was helpful. Enjoy your travels!